If you are interested, the David B is a pretty good story anyway. It was built in 1929 to support the Alaska fishing fleet, wound up abandoned, and was recently restored by Jeffrey and Christine Smith. They have created a small ship cruise business around the David B, based in Bellingham, Washington. Here is their website. They will take you around Puget Sound, the San Juan Islands or up the Inside Passage to Alaska, if you like. 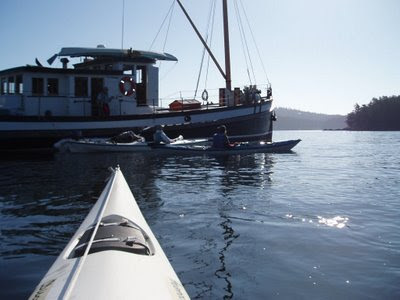 We took a trip around the San Juans, towing the Whitehall and carrying kayaks on the ship. Days were spent out on the boats or hiking the islands, evenings with wine and gourmet meals, and nights in comfortable beds. The nicest way to explore, in my opinion.